Preqin’s September edition of Hedge Fund Spotlight highlighted that large hedge funds display the most attractive risk/return profiles, while smaller funds can offer more favourable terms and conditions such as shorter lock up periods and redemption frequencies. Smaller funds may attract investors with their ability to nimbly navigate markets as well as having lower fees than their larger counterparts, being better placed to align their strategies with investor interests and often offering niche strategies. Larger funds however, may have a longer track record and a greater ability to grow capital with larger opportunities accessible to them. These attributes can be key for investors seeking both strong performance and stability in returns. Preqin’s Hedge Fund Analyst online service shows that funds with assets under management (AUM) of more than $1bn have posted the largest returns in 2015 so far, with a year to date figure of 1.89% compared with emerging mangers (AUM of less than $100mn) at -0.40%. Over a medium horizon, large funds (AUM greater than $1bn) have also generated the highest returns; outperforming the All-Strategies Hedge Fund benchmark in both three- and five-year annualized returns with 8.12% and 7.53% versus 6.59% and 6.38% respectively. While in positive territory, emerging funds posted the lowest returns over these horizons, underperforming the All-Strategies Fund benchmark with 5.45% in the three-year and 5.56% in the five-year annualized return. 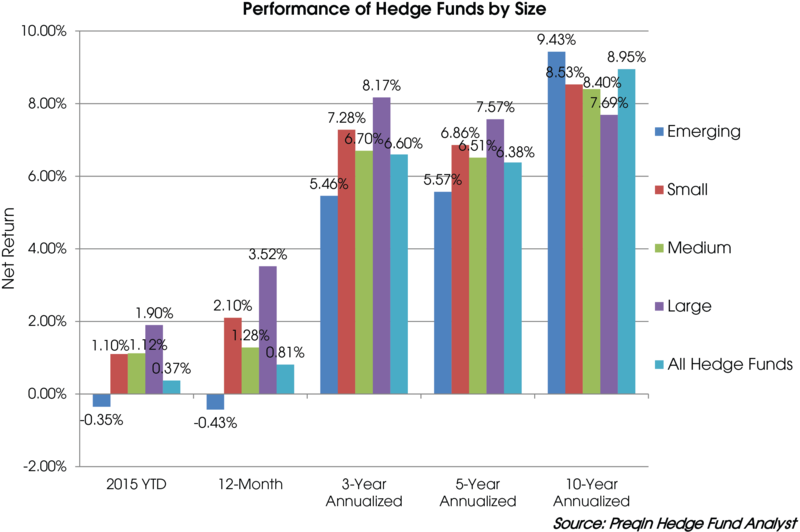 However, over the 10-year horizon, emerging funds outperformed all other size categories as well as the All-Strategies Hedge Fund benchmark, posting 3.92% compared with large funds’ 3.26%. Volatility, however, is also a key concern for investors; emerging funds have generated the highest volatility over the three-year horizon, at 3.92%, with the lowest annualized return, in contrast to large funds which posted the lowest volatility of 3.26% over the same horizon, but with the highest return. While emerging funds are able to offer longer-horizon returns to investors, volatility may be too great a concern to make such funds attractive to many investors. However, emerging funds may be a viable option for more established investors that have the experience and expertise to select the emerging funds that can achieve outstanding returns.